If you design fancy cakes from scratch, chances are you use both fondant and gum paste. Both of these are pliable, dough-like confection you can color as you choose and model into various shapes. Fondant is made with gelatin and remains soft and pliable as you work with it. Gum paste is made with egg whites, confectioners’ sugar, and shortening, can be rolled thin and molded, but dries hard and can become brittle. 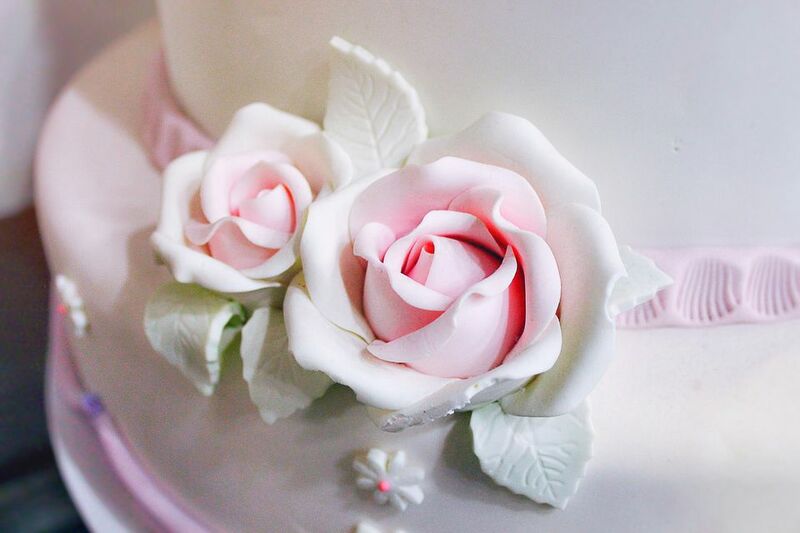 While professional bakers may use fondant to cover an entire cake, they are more likely to use gum paste to make decorations. You can easily go out and buy commercially made gum paste. But, homemade gum paste is better than pre-made because it is less expensive and creates a product that is easier to use. Pre-made gum paste tends to be a little stiffer and is more likely to crack. The amount of gum paste created by most recipes might seem like too much for a non-professional project. However, gum paste can be frozen for up to six months as long as it is wrapped properly. Simply let it thaw in the fridge and then allow the gum paste to come back to room temperature before using it. Once it's thawed, it's perfect to make flowers or other cake design elements. It is important to allow enough time when creating gum paste. Each step is crucial to the finished product, requires a set amount of time, and will impact the designs you create. This recipe makes make about two pounds of gum paste which is enough for an entire garden of handcrafted sugar flowers! A heavy duty mixer with a paddle attachment—this is essential for the correct texture. Pour the egg whites into the mixer bowl and beat with paddle or scraper attachment for about 10 seconds at high speed. Turn the mixer to low speed and slowly add powdered sugar; once sugar is thoroughly mixed in, turn up mixer speed and beat for about two minutes until the mixture is shiny and makes soft, collapsible peaks. If coloring the gum paste, add slightly more color than you will want in the end, as it will fade. Either gel or liquid color is appropriate. Turn the mixer to slow speed and slowly add the tylose. Then turn up the mixer speed until the mixture is thickened to the texture you prefer. Pour out the mixture onto a work surface covered with powdered sugar. With shortening on your hands to avoid sticking, knead the paste until you have formed a soft dough that is not sticky. Store gum pastes in a sealable plastic bag for at least 24 hours before using. It can be kept frozen for up to two years if desired. When you are ready to use the gum paste, knead in vegetable shortening to soften it. Adjust the amount of sugar you use based on the humidity of your environment. Add more if there is a lot of moisture in the air; add less if it is dry. Always scrape the sides of the bowl down to ensure all the powdered sugar is mixed with the eggs. Do not under-mix the eggs and sugar. When finished, the mixture will be very thick and glossy and look like meringue. Undermixing will produce gum paste which is not pliable or easy to handle. Sprinkle the tylose powder into the mixing bowl while running the paddle at low speed. Do not simply dump the powder in or it will clump up. Take the extra time to scrape off the paddle and gather as much gum paste as possible because even a tiny amount can create a few flowers. Separate the gum paste into at least two smaller balls so it is easier to knead. Add extra powdered sugar in very small amounts as you knead the gum paste because it is hard to remove too much sugar if your texture becomes dry! Gum paste dries out very easily if left exposed to air, so wrap the finished ball as well as the ball waiting to be kneaded tightly in plastic wrap. The finished ball of gum paste should also be placed in a zip-top bag with all the excess air pressed out.